Clueless is one of my favourite 90’s movies. 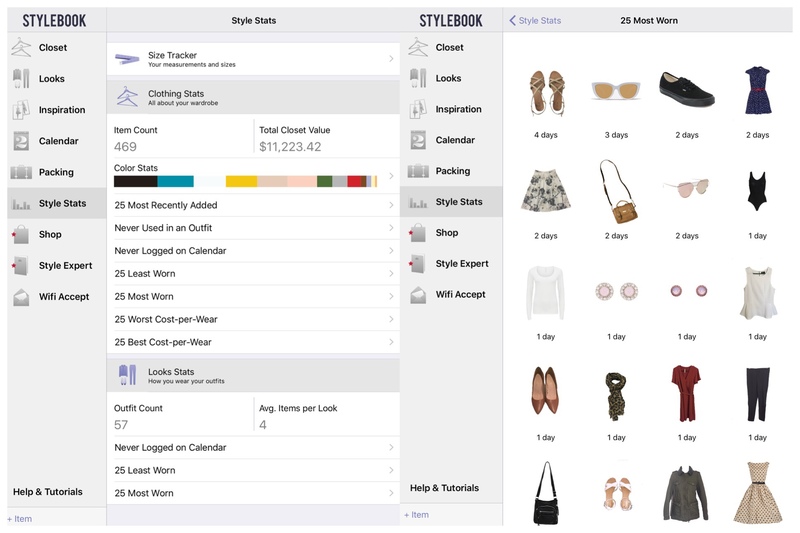 Well we are in luck – there is an app called Stylebook which is bringing that dream to life! Before I start, this is not a sponsored post. I bought the app myself (it was around $3.50 when I bought it in late 2015) and I have used it for quite a while. 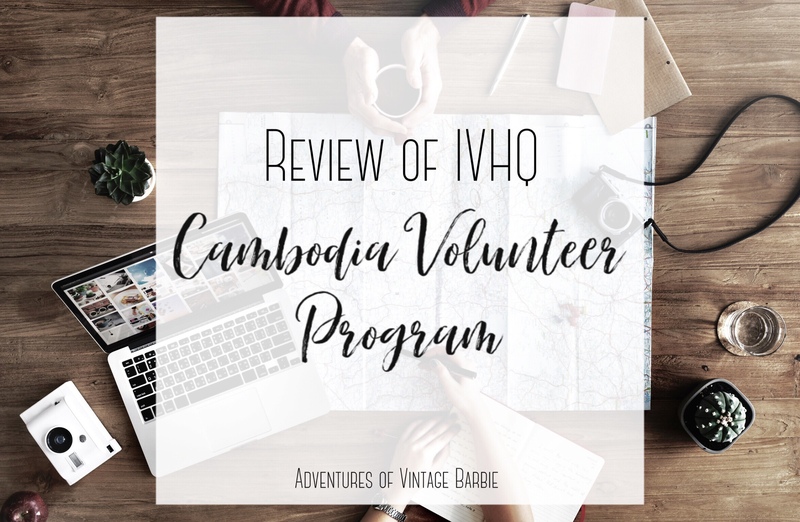 I wanted to share my experience, as well as both the benefits and downfalls. 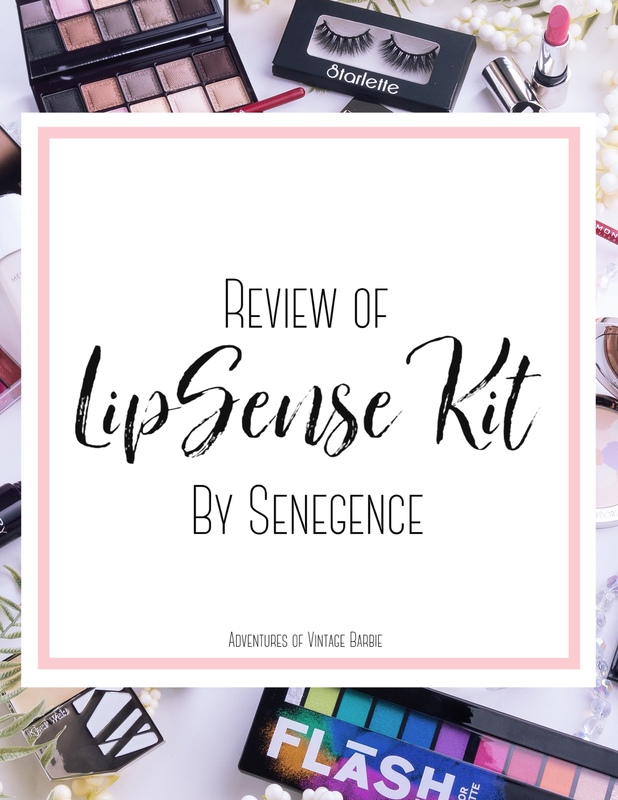 I have now got an affiliate link for it because I love it and I only promote products I truly like and believe in. That link is here and only at the end of the post. 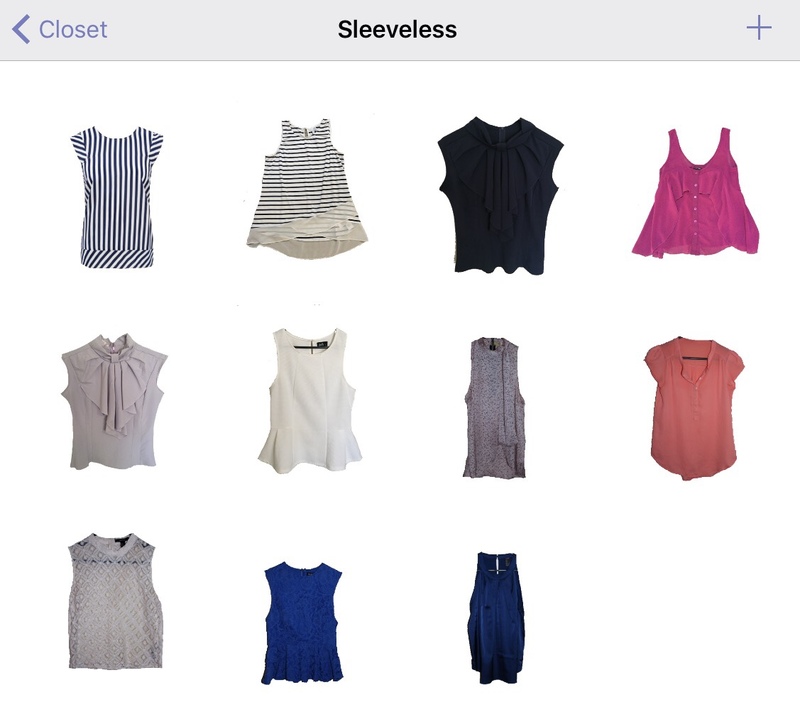 It is an app (for IOS users only) where you take photos of your clothes and organise these via the categories in the app. You then use the app to basically “shop your wardrobe/closet”. You can make outfit combinations to see what works well together. You would actually be surprised about how many items in your closet you love and how many items have been forgotten about! The outfit combinations also work in organising your life. For example you can make some outfits for your week of work, add them to your calendar and save time in the morning trying to figure out what to wear for the day! It also organises your closet because you can give the item a status such as available, lent out, in the laundry basket, at the dry cleaners, in storage, at the tailor, to donate and should replace. This has made it so much easier when trying to find an item I thought I had washed only to remember I lent it to my sister! You can put in all the details about the item, such as brand, size, colour, cost and season. In style stats you can see the total value of your wardrobe, what colours you have the most of, and the value of the items per wear. Seeing the value of items is so important in helping you decide whether you should keep or dispose of items in your wardrobe. It also makes shopping easier too. 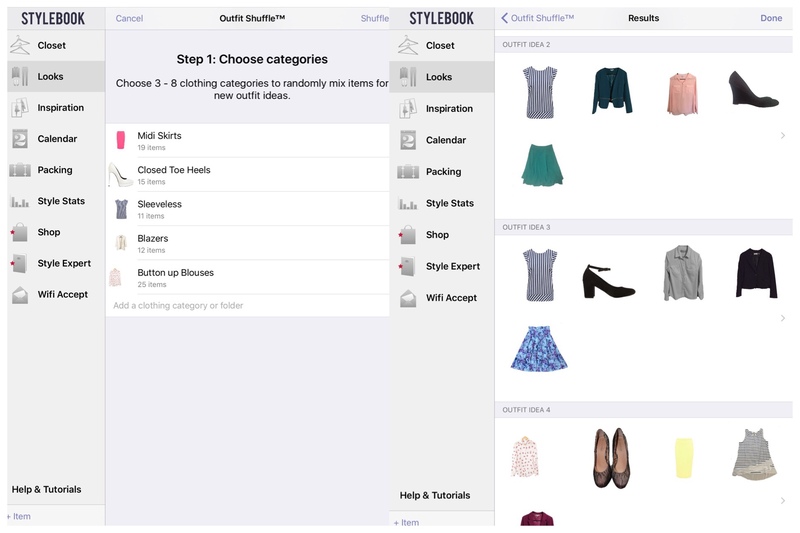 When you are out shopping, jump onto Stylebook and see if you already have a similar item. If you have a similar item, do you really need to buy another one? Also, you can go through your app to see if you have other clothing items that go with it. A good rule of thumb is that you should have a minimum 3 items that can go with the new purchase. If it doesn’t work with at least 3 items, don’t buy it. Now you’re saving money and closet space! 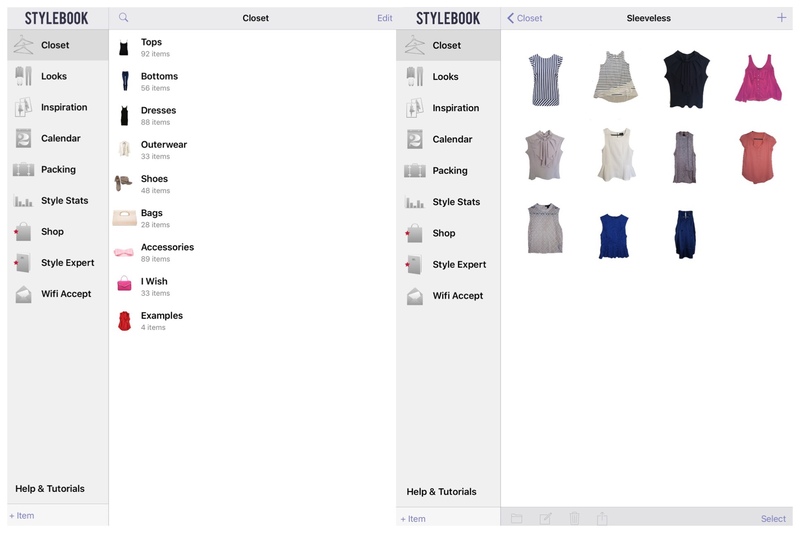 There are actually a lot of tips and tricks on to use Stylebook – the app has tutorials included with the app and there is also a blog that you can go to for more information. But there’s some key features I want to point out as they are essential in using Stylebook. 1. Upload to Stylebook app by selecting the “+” icon. Select “Add clothing”. Either paste from clipboard, take photo or choose from album. 2. If you don’t yet have a photo of the item, take photo of item laying flat on a sheet or block colour surface. Make sure that background is a completely different colour to your item eg: light coloured background for navy, blacks, dark or bright colours and a bright or dark background for light colours, greys and whites. 3. Remove background from item. You should be able to do this automatically but some times you need to manually do it. 4. Add details such as colour, material, size, brand and price. 5. Save to the category it belongs to. You can edit, delete, or create new categories in when you are in the “Closet” tab. 1. Open the “Looks” tab and select the category if it to be saved in. 2. Select the “+” icon and select clothing you would like for the outfit. 3. Pinch the item to resize it and hold down to move the item. If it is difficult to resize, double tap the item and select “manual resize”. 4. Items can be layered or sent to the back. Double tap them to bring up these options. There is also an option to remove item form outfit. 5. If you wish, add notes to the outfit. These are helpful if you are searching for a particular outfit as they come up as key words. 6. When you wear the outfit, add it to your calendar so you can keep track of the cost per value for the items. You can add it to the calendar before the day begins to help you get ready and be organised. The cloning function is also really helpful. It copies/clones the item outfit you have but you can then change aspects of the outfit whilst preserving the original one. This is great if you want to see how many different outfits you can create with the same pair of shoes and blouse, for example. You can change the bottoms and other accessories to creat plenty of different potential outfits. There is also a really cool feature called “Outfit Shuffle” in which the app comes up with outfits for you! So it really is Cher’s wardrobe technology coming to life! Just go to “Looks”, select the shuffle icon, choose 3-8 categories that you would like to see used, and select shuffle. If there is a combination you like then select it and arrange the items as you would for outfit combinations. Packing can be stressful sometimes and can take the fun out of going away. But Stylebook makes it less stressful. Take a look at the pic below. What would your prefer: rummaging through clothes scattered all over the bed, floor or dining table, or using the Stylebook app without ever having to take unnecessary items out of your wardrobe. I find that when I’m packing I often get out lots of different items I want to take with me and then try and cull items. Half of the items get thrown back into my wardrobe in a messy pile and I have to deal with it all when I return from my trip. I usually overpack anyway and have to unnecessary lug around items when I’m away. With Stylebook, I start figuring out what I want to take about a week before I go away. 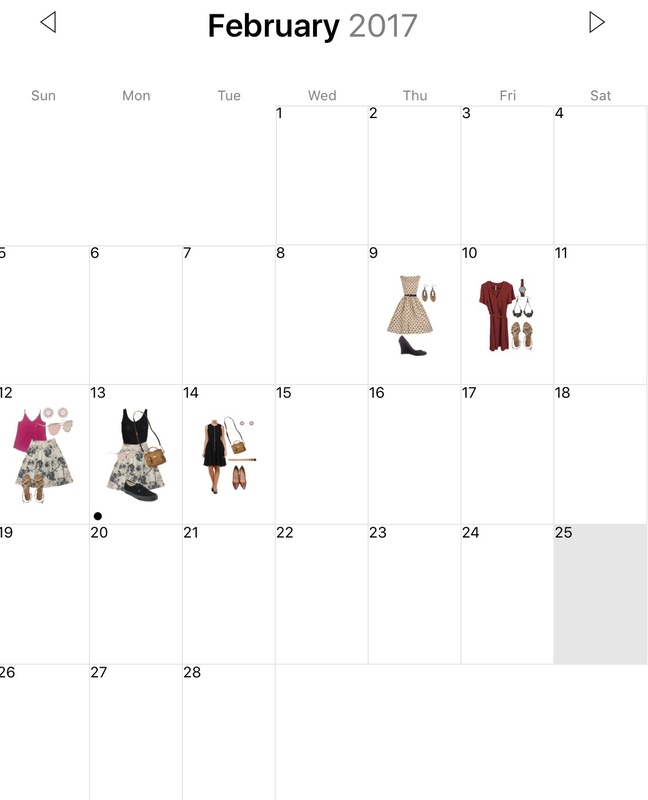 I create outfit combinations and figure out what day I’m likely to wear them. I usually realise that I only need a few items anyway. I recently had a trip to Brisbane and I only needed to take took my tote handbag with my clothes for the weekend. That included 2 pairs of shoes and even a large drink bottle in there! To make your own packing list, go to the packing tab and create a new packing list. Name the list/trip and add in any notes about the packing list such as the destination, climate, occassion or any other important info. Go to clothing and simply add clothing items. If you decide you don’t need it then delete from list. You can also add outfit ideas in looks. When you are ready to pack, select start packing and you can check off items as you add them. Simple! Once an item is used in an outfit and added to a calendar day, you will start seeing a “cost per wear”. This is the amount the item was bought for/the retail worth and then divided by how many times it has been worn. The lower the cost per wear from the original pice, the more value it has given your wardrobe. If you have never worn the item, the cost per value will be the cost you bought it for. To check the cost per value on individual items, select the item and then go to the items’ details. It will tell you at the bottom the cost per wear. 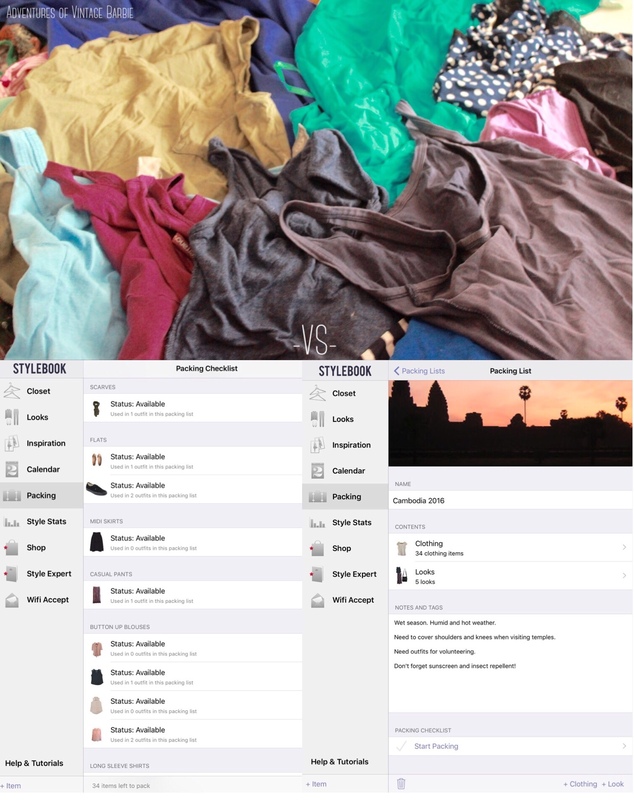 A better way to see what items in your wardrobe are giving you the best or worst value is to go to your Style Stats tab on the left hand side of the app. Select either the 25 Best Cost-Per-Wear or 25 Worst Cost-Per-Wear. This will group together the items you should be aware of. This is important for two reasons. Firstly by seeing what is most valuable you can see what you wear most. This will help narrow shopping down by ensuring you buy items that match with it. The second reason the cost per value is important is because it shows what you don’t wear and should probably get rid of. By having the original price there, as well as other details like brand, season and material, you could easily sell the item online. 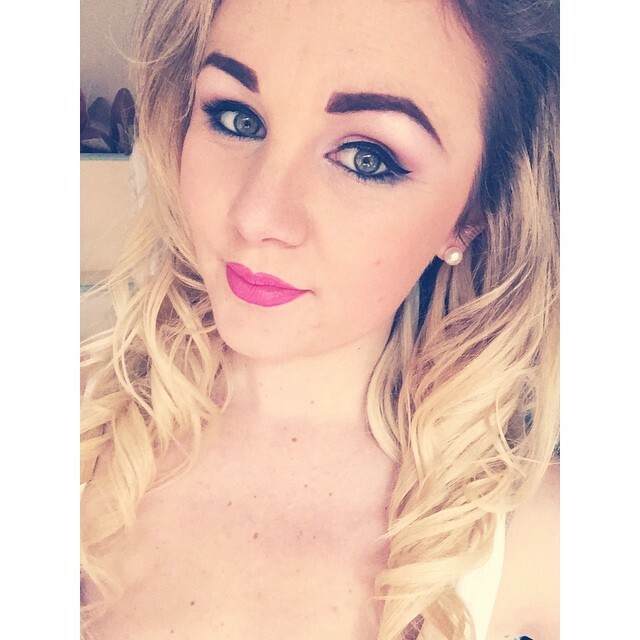 It can be time consuming uploading your pics to the app. If you don’t have the item on a flat surface (eg on top of your bed with wrinkled bedspread), the light is not too good (not enough natural light or there are shadows present) or if you put the clothes on a surface that is similar colour, then the automatic background remover may not work. That means you may have to use the manual edit to take out the background yourself. I also don’t log every single days worth of outfits in my calendar. It’s something that you really need to be in the habit of doing. Until you get into that habit and actually log your outfits , then you won’t be able to see the stats about the best or worst cost-per-wear. Start small. Chose items you wear on a regular basis first – for example take photos of work clothing items first. Or do items in groups such as dresses one day, skirts and pants next day, and tops the next day. This will stop you from feeling overwhelmed by trying to get your whole wardrobe onto the app at once. Use pics from websites. There is a “shopping” function through the app whereby you can add the item straight to your wardrobe from the website. But if the shop is not “connected” to app, easiest way is the go to the shops website. Screenshot the item, crop the item in iPhone photo editing so it is just the item you have on the image, then upload that to the app. Use inspiration photos. You can upload images of outfits or clothing combinations you like and then “shop your wardrobe” to create the same or similar outfit. Take photos of new items as soon as you get them. Do this before you even put it in your wardrobe. If you get into this habit then items will quickly be added to your wardrobe. Use spare time to make outfit combinations. Watching mindless tv is a good time for this. Or when you are catching public transport to/from work. Or when you’re waiting for a friend for a catch up, or an appointment. Then you can easily add these outfits to your calendar or help you pack for a trip away! Visit www.stylebookapptips.wordpress.com This is the site dedicated to all things Stylebook and is super helpful in explaining how everything works, including how to get catalogue quality photos of clothing items. I finally feel like I have some proper organisation to my wardrobe and it’s helping me cull items I don’t wear, no longer need, or that doesn’t fit my personal style. It’s actually helping me develop a great sense of style and I love that it’s in the palm of my hand! 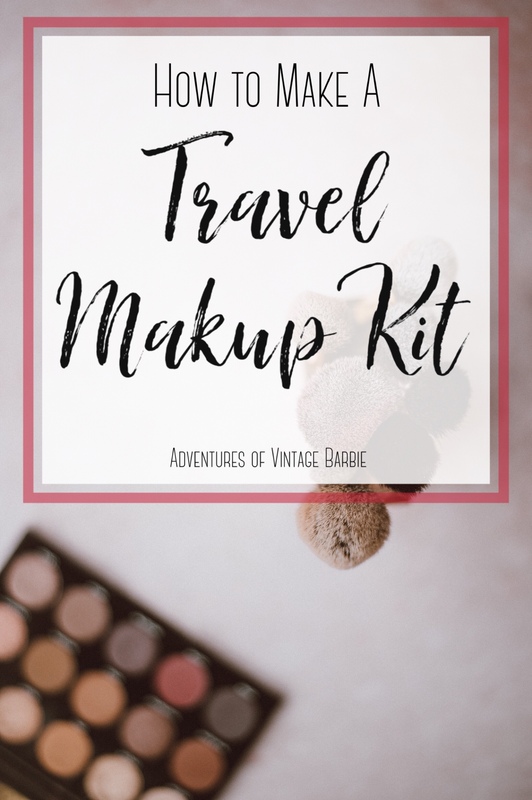 I’ve found packing so much easier too and I’m less likely to overpack for a weekend away. 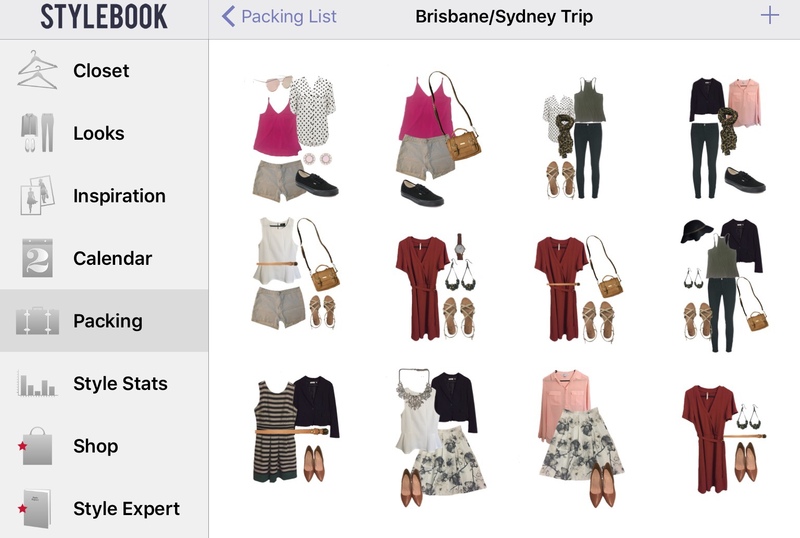 Stylebook makes it easy to treat a packing list as a temporary capsule wardrobe. It’s also lots of fun shopping my own wardrobe and saving money. I quite enjoy making up the different outfit combinations and it can be done very quickly. I usually do it when I’m watching Netflix or on the bus home from work. I knew that had a lot of things (especially clothes) but didn’t realise how much until I started using this app. It helped me cull my clothes because when I started taking pictures for the app, I realised that I didn’t wear/like items that were in my wardrobe. I’ve started to see what I need to add to my wardrobe, so I now know to look for those items specifically when I go shopping, rather than just buying whatever looks pretty. 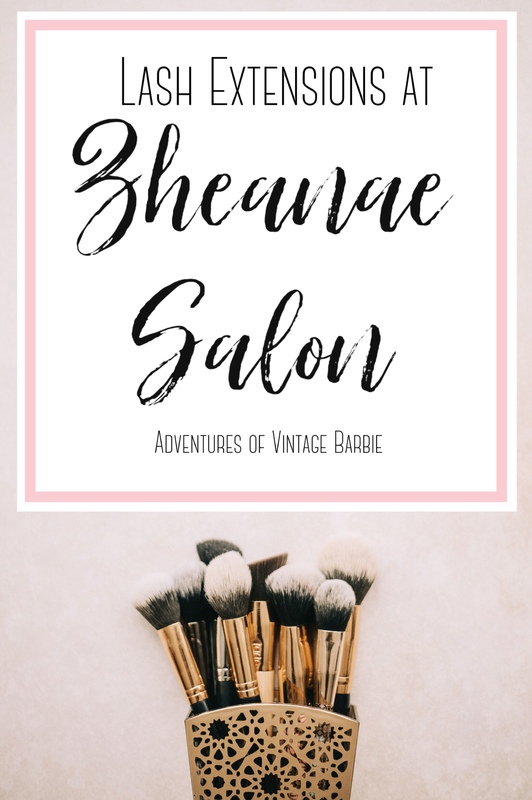 I still definitely buy pretty things that I don’t necessarily need, but I can make sure they go with items I own already by checking my Stylebook app when I’m either doing online shopping or at the mall. It really is an awesome app and I would recommend it to anyone who loves fashion, wants to get organised, and wants to develop a great personal style. Have you used Stylebook? What are your thoughts on this app? Let me know in the comments section! Want to get Stylebook yourself? Click here.